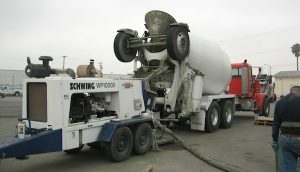 Concrete pumping in Paso Robles is where all the action is at! Concrete is huge business out here in Paso Robles, CA. With an ever-expanding and booming wine industry picking huge steam putting this once tiny and barely on the radar town has now put it right on the map. Let’s also not forget to mention Firestone brewery also exploding in growth in this little town. Is it any wonder humongous concrete ready-mix plants have planted their batching plants right in the industrial part of town? Huge concrete ready-mix companies like Hanson Aggregates, CalPortland, and Allied Ready Mix have set up their concrete plants right off of highway 101, on the south side of Paso Robles. Naturally, there are a whole lot of concrete contractor doing business here in Paso Robles. I just picked up the ol phone book off of my driveway just to see how many concrete contractors are out here. With all the growth taking place I sure am glad that I can be the guy the call for their concrete pumping in Paso Robles. I’ve done it all when it comes to concrete pumping. From pouring concrete into new retaining walls for a whole new housing tract, to grouting block wall for the Paso Robles police station back in 2002, to pouring a simple 6-yard patio slab out on a home off of Niblick Rd. So if you’re a contractor that needs a reliable concrete pumper in your Paso Robles job site then don’t hesitate to give me call today! I will be at your job site on time with hoses out and primed and ready to go. I’ll have my concrete pump fired up and ready to go before that first mixer arrives. Hey look, I know that you as a concrete contractor, are always aiming to put out great quality work, put out dependable service, and make a pretty lasting impression with the work that you do. I take the exact same approach when it comes to concrete pumping. I want to give you great work, dependable work, and make a great impression so that you’ll give me a call back the next time you need concrete pumping in Paso Robles. Whether you’re pouring architectural design, decorative concrete, patios, driveways, stamped or stained concrete, flatwork, foundations, or retaining walls, give me a call and I’ll be happy to set up my pump and get the concrete poured for you.